An interactive installation that makes tangible the embodied knowledge manifested in female labour and experience. By envisioning absurd alternatives that blur the lines between manual, intellectual and automated labour, Grasper examines the politics of work, knowledge and the body. Domestic chores, crafts, manual factory work and other dexterity-requiring occupations traditionally carried out by women take place outside hegemonic systems of knowledge production, but entail a different kind of epistemology—one of sensuous, intuitive and experiential wisdom stored in the haptic memory. Envisioning absurd alternatives that blur the lines between manual, intellectual and automated labour, ’Grasper’ examines the politics of work, knowledge and the body. 1. Grip the base of the teat whit your thumb and index finger to trap the milk in the tip. 2. Close your remaining fingers around the teat one by one to work the milk downwards and squeeze it out. 4. Repeat for each teat. Building on my research on emotional labour for the theory module group project in term 1 and my essay on feminist philosophy of science in term 2, I was interested in exploring further the gendered division of labour and knowledge. Also working constantly with screen-based art and visual representations encouraged me to examine more tangible and subjective experiences and approaches that are not usually employed in science and technology. 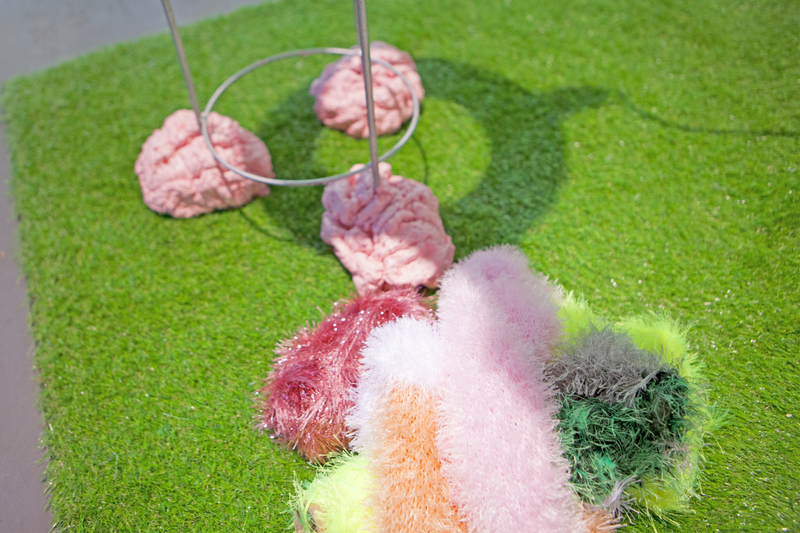 While modern science considers vision epistemologically superior to other senses and is preoccupied with visualising technologies, I was interested in investigating what kind of knowledge can be produced through the sense of touch. The activity of a woman in the home as well as the work she does for wages keeps her continually in·contact with a world of qualities and change. Her immersion in the world of use—in concrete, many-qualitied, changing material processes—is more complete than [a man's]. And if life itself consists of sensuous activity, the vantage point available to women on the basis of the contribution to subsistence represents an intensification and deepening of the materialist world view and consciousness available to the producers of commodities in capitalism, an intensification of class consciousness. So the “wisdom of the hand”—the embodied, experiential and tactile knowledge—is especially characteristic to women’s labour and lives. 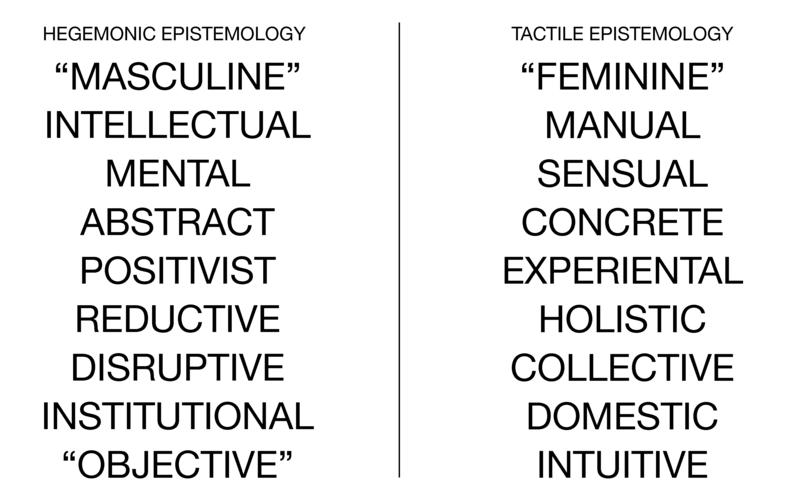 I was interested in the contrast between this tactile, concrete, manual and feminine epistemology and the intellectual, abstract, mental and masculine epistemology of hegemonic science (see diagram below). It is salutary to be reminded that it was only with the formation of engineering as a white, male middle-class profession that male machines rather than female fabrics became the markers of technology … During the late nineteenth century, mechanical and civil engineering increasingly came to define what technology is, diminishing the significance of both artefacts and forms of knowledge associated with women. I was interested in portraying the fundamental connection between female labour and the history of computing, exemplified by the use of punch cards in early mechanical looms leading to the invention of Charles Babbage’s Difference Engine. 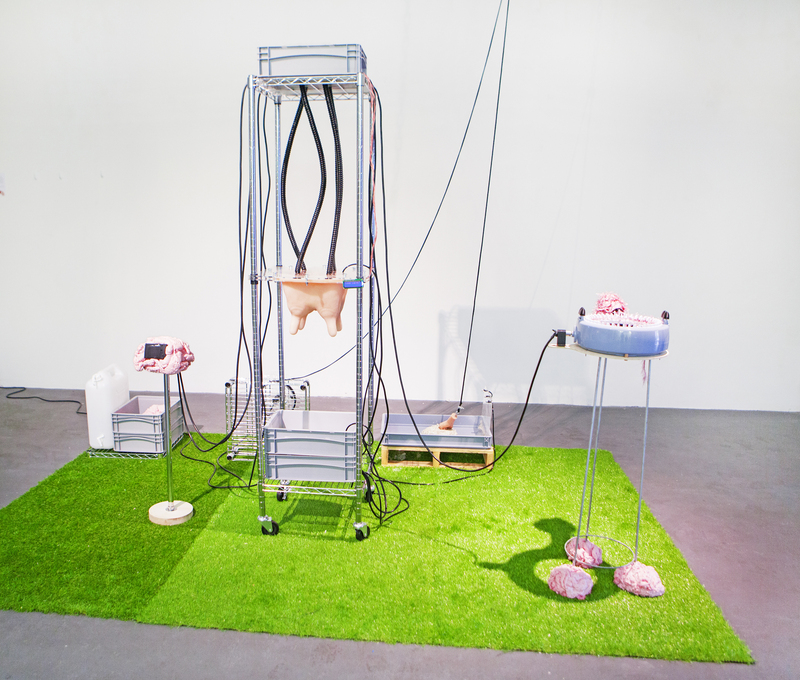 Thematically and aesthetically I was inspired by the work of video and installation artist Mika Rottenberg, whose work often portrays surreal assembly lines where women’s bodily processes are contrasted with industrial processes as a means to examine the subject of female labour. I wanted to create a similar experience of an amusing but uncanny factory that exhibits absurd causalities. Some of my aesthetic references were the works of Estonian installation artist Katja Novitskova and Lithuanian artist duo Pakui Hardware. They both employ and appropriate disturbing but aesthetically refined imagery inspired by industrial machines, medicine, biology and science fiction. 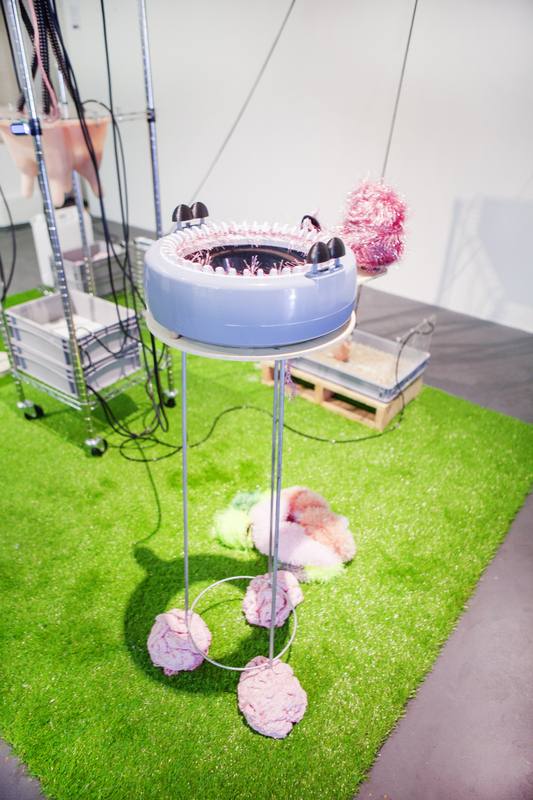 In the same vein, I wanted my installation to be a strange but sleek hybrid between a domestic setting, a factory and a laboratory, inviting to be touched and felt. 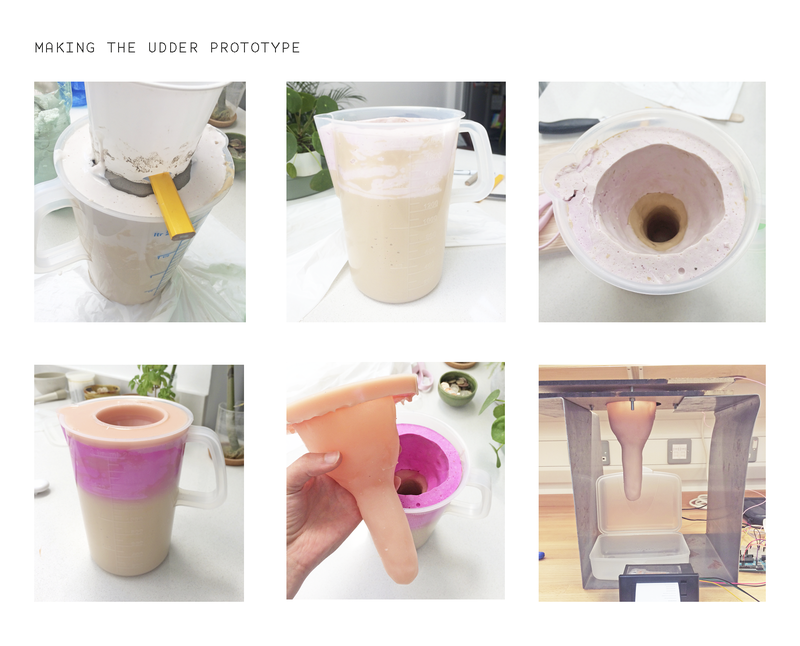 Making the silicone udder was probably the most time-consuming part of the project, and I also learnt the most from it—albeit not strictly computational skills. I did not have a lot of experience in mould-making or casting, except the small silicone soft robot tentacle I made for physical computing term 1, so I carried out extensive research and tests with different materials. After multiple trials and errors I resulted in sculpting the original from plasticine, making a mould from plaster of Paris, an casting the udder in very soft but flexible (and very expensive) Smooth-On ECOFLEX 00-30 silicone. The design of the mould and the casting process was quite complicated, since the finished udder and all the four teats had to be hollow. In addition, the silicone needed to be thick enough not to break, but thin enough not to use excessive amounts of material. I designed a two-part casting process where I used 3D printed base shapes over which I sculpted the plasticine and cast the outline of the udder. I then used an identical base shape to create the inner cavity, and cast silicone between the carefully aligned shapes. In addition to using sensors to detect the user’s touch, the udder was also fully functioning in regard of actual milking. After filling the udder with rice-based milk and piercing small holes in the tips of the teats, it simulated a real cow udder with surprising authenticity. The udder was emptied very slowly, so in the end didn’t install the automatic milk circulation system I had planned, but manually refilled the udder once during the exhibition with the help of the pump used elsewhere in the installation. I initially tried making my own stretchy pressure sensors for detecting the user’s interaction with the udder. 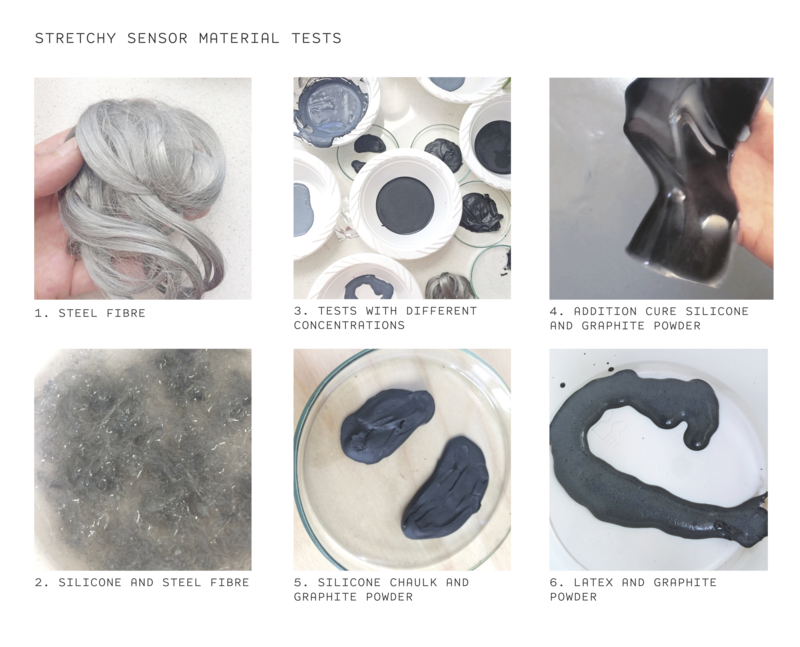 Inspired by this tutorial I experimented with mixing different conductive materials, like graphite powder, carbon shavings and steel fibres with multiple kinds of silicone, latex and rubber. I found out that the mixtures that used graphite powder were conductive when wet, but when cured they lost conductivity because the particle size of the powder was too small. The trials using carbon shavings and steel fibre remained conductive, but because of the large particles the material was stiff and uneven. In the end I resulted in using ready-made conductive rubber cord sensors. Because the resistance of the sensor changes when it’s deformed, it is easy to use for detecting stretch and pressure. I used a simple voltage divider circuit for detecting the change in resistance when the user pulls or squeezes the udder. However, the sensor takes a while to revert back to its original state after being distorted, so in the Arduino code I had to measure the relative change of resistance in stead of absolute values. In addition to the touch data from the udder, I wanted to measure the amount of liquid being milked. I looked into hacking a kitchen scale to interface it with Arduino, but found out that building my own scale was cheaper and easier, since I wanted to measure very small changes in mass but be able to go up to 10kg. Following this tutorial I constructed a simple scale using a bar type aluminum load cell and a HX711 module. I used this library to calibrate and receive readings from the scale. The individual calibration factor of the scale was acquired by weighing coins, because their mass is known very precisely. In the finished installation the scale was used to measure the total amount of liquid in the milk container and also the amount of liquid the user has milked in the last minute. Despite trying to avoid screen-based visualisations, I wanted the user to have some kind of instant and legible feedback of the interaction while milking. I decided to use a small LCD screen to display data about the touch and the performed labour, and also display a prompt “Please squeeze” to encourage visitors to interact with the installation. 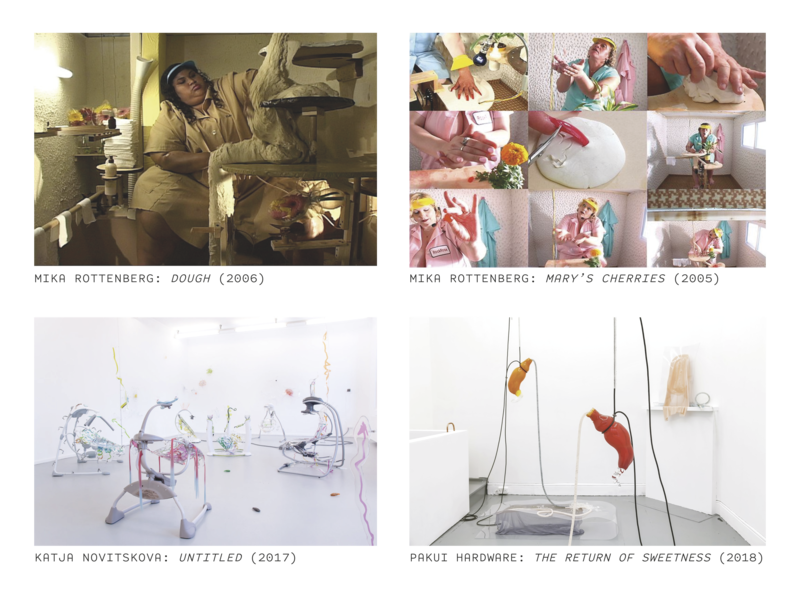 My aim was to translate the interactive experience of milking into physical outputs that would make tangible the embodied knowledge and manual labour expressed and performed by the user. 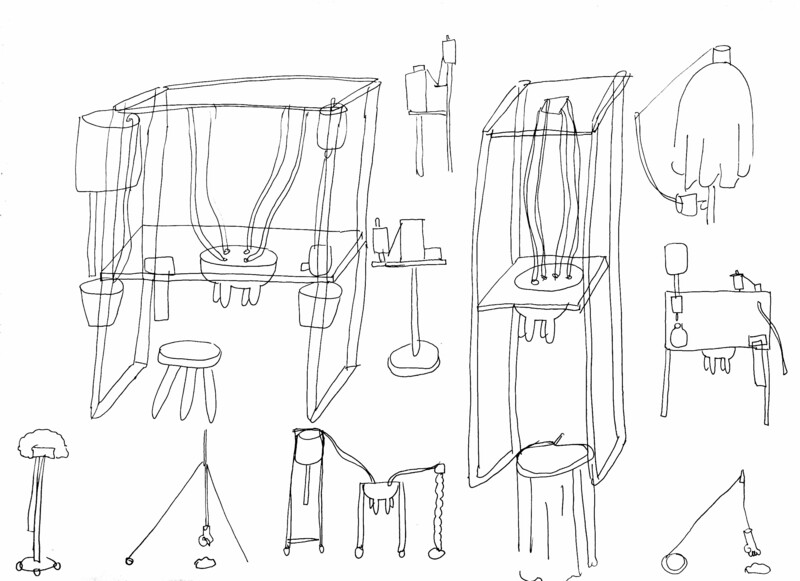 I wanted to use four different outputs—one for each teat—to map the udder sensor data into a different domain, and to create an illusion of an absurd machine with surprising interconnections and causalities. 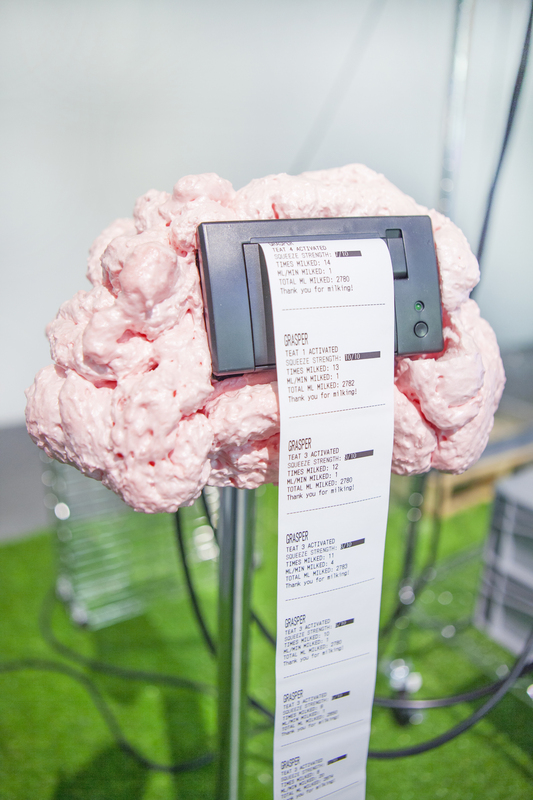 The first output is a mini thermal printer which prints information about the interaction, translating the subjective experience to quantified data, while also contrasting the antiquated domestic labour with modern capitalistic consumerism. The thermal printer was interfaced with Arduino using Adafruit’s Thermal Printer library and examples. I made a casing and a pedestal for the printer from polyurethane foam, metal shower curtain rod and plywood to make the aesthetics of the installation more consistent. The second output is a hand that kneads dough, moving vertically based on the sensor input. The hand is suspended from a rope which is reeled in and released with a winch and pulley system. Following the servo motor gear I made for my previous Creative Coding project, I initially built a similar gear system for the hand. Because the servo can only rotate 270 degrees, I wanted to increase the amount of rotations to increase the displacement of the hand. However increasing the speed of the second gear (i.e. increasing the displacement) decreases the torque, so the 17kg servo motor was not strong enough to lift the <1kg weight anymore. 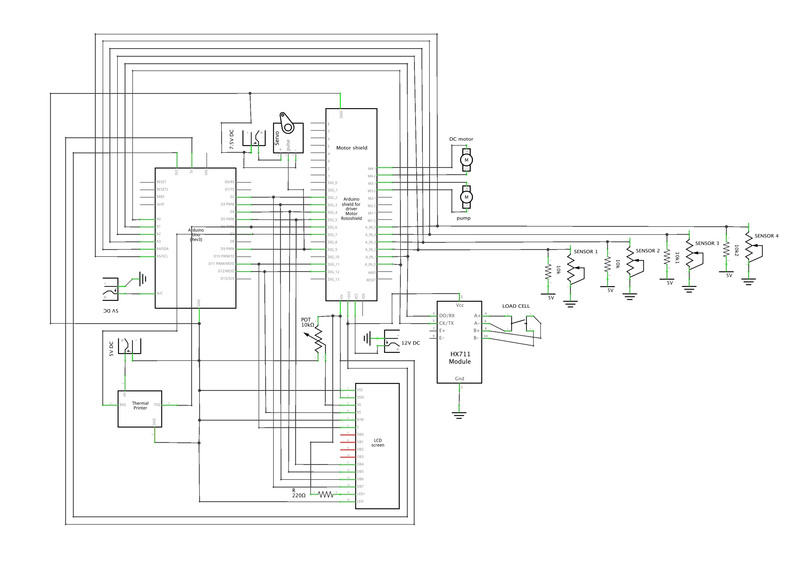 I also looked into using a stepper motor or a DC motor, but the problem with a stepper is that it can’t be locked into a position when inert, and with a DC motor it’s difficult to accurately calculate the rotation angle. I ended up building just a simple rope barrel with sheet acrylic, ball bearings and 3D printed parts, rotating with a 7.5V high-torque servo motor. The hand is a cast of my own hand, made with silicone in a fast-curing alginate mould. The third output is a knitting machine, made by installing a motor to a ready-made knitting mill. I had to disassemble the entire apparatus and reverse-engineer how it works to be able to replace the hand-operated handle with a motor and a 3D printed cog. I also made a base for the machine with an integrated yarn holder by attaching a laser cut plywood shape to a second-hand flower stand with 3D printed clips. 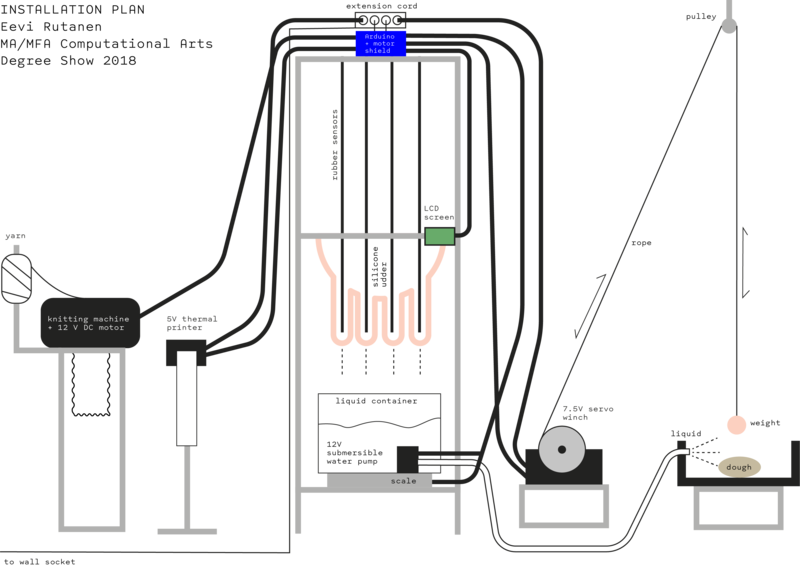 The fourth output is a submersible 12V aquarium pump spraying liquid from the milking container onto the dough when the user squeezes the udder. The four sensor inside the udder and all the outputs and other electronics are controlled with one Arduino. The knitting machine motor and the pump are controlled with an Adafruit motor shield. The circuitry is soldered onto a stackable prototype board, and the outputs are connected to the Arduino with long 3 core cables, soldered to smaller wires and connected to the board with detachable header pins. I do not think I want to develop this particular piece any further, besides perhaps making it more robust to endure vigorous user interaction. However I am keen to continue working with the themes of tactility, crafts and embodiment, and carry on combining computation with experimentations in unusual materials. Also working with sound would be an interesting and challenging continuation after experimenting with the sense of touch. Overall I am satisfied with the installation I produced. I think it articulated the ideas I set out to explore, and it was aesthetically and thematically a coherent piece. The main issues I experienced were caused by unexpected user behaviour and lack of robustness: Visitors were pulling the udder notably harder than I anticipated, which led it to be out of order a few times during the exhibition. I had to carry out some maintenance on the piece on several occasions, because parts were wearing down due to heavy use (according to the receipts printed, the udder was milked over 600 times during the opening night alone). On the other hand, I could not reliably test user interaction before everything was finished and set up, at which point it was too late to make drastic changes. Although it was rewarding to see that the piece was very popular during the exhibition and visitors were excited to interact with it, in the future I would make something that doesn’t invite such heavy handed interaction, or at least make the piece durable enough to endure it. It also seemed that the users were so preoccupied with getting the milk out that they didn’t really care about the other outputs. Even though there were instructions on how to properly milk the udder, people had trouble extracting the milk and therefore used excessive force. In retrospect I also wish I had done something computationally more ambitious that required less fabrication and resources. Despite really enjoying making physical things and learning a lot about different materials, casting, constructing, etc., I spent a disproportionate amount of time and energy (and money) on the non-computational aspects of the work. I probably should have made something more simple and smaller in scale, but I have wanted to make sculptural large installations for a long time, so I suppose I got a bit carried away by the prospect of it. On the other hand, I now have plenty of ideas for computationally more challenging projects I want to take on during the second year of the MFA. Barad, K. (2012) “On touching—The inhuman that therefore I am”. differences, 23(3), pp.206-223. Essinger, J. (2004) Jacquard's Web: How a hand-loom led to the birth of the information age. Oxford: Oxford University Press. Harding, S. ed. (2004) The Feminist Standpoint Theory Reader. New York and London: Routledge. Kallhovd, O. (2017) HX711 library and examples. Pallasmaa, J. (2005) Eyes of the Skin. London: John Wiley & Sons. p_leriche (n.d.) How to Build Arduino Weighing Scales. Rose, H. (2004) “Hand, Brain and Heart: A Feminist Epistemology for the Natural Sciences” in Harding, 2004. Wajcman, J. (2007) “From Women and Technology to Gendered Technoscience”. Information, Communication & Society, 10:3, 287-298.